This is my homemade version of a 1960s dessert. The original recipe could have been found on Strawberry Jell-O package or CoolWhip containers. I thought it was brilliant, despite the fact that it was overly sweet, too stiff from the Jell-O and, if one were being picky, they may point out the slight chemical after taste. But, in its defense it was fast and very pretty. My version of no-bake strawberry cheesecake is made with nothing but fresh sweet strawberries, cream cheese, real whipped cream, and just the slightest bit of gelatin to keep it standing tall until you bite into it, then it melts in your mouth. No oven required, which makes it ideal for the sultry summer days. Watch my quick video on how to make and assemble the strawberry cheesecake. In a food processor grind the graham crackers until they are broken into a fine powder. Add the butter, nutella, brown sugar, salt and cocoa powder and process until it is all well incorporated. You may have to scrape down the sides of the bowl a few times. Press the crust evenly into the bottom of an 8 or 9-inch spring form pan. It should come up the sides slightly. Sprinkle the gelatin over 2 tablespoons of cold water in a small bowl. Allow it to sit for about 1 to 2 minutes. Transfer the gelatin to the strawberries and gently cook over low heat. Whisking just until the gelatin is completely dissolved. Remove from heat. Reserve ¾ cup of the strawberry mixture for the top layer of the cake. In a stand mixer beat the cream cheese and sugar on medium-low speed, using the paddle attachment, until smooth. Add the vanilla extract. Add the strawberry topping, except the ¾ cup you have reserved for the top layer. In a separate bowl whip the heavy cream until medium peaks. Fold the whipped cream into the strawberry cheesecake batter. Gently folding just until it is all combined. Pour the cheesecake into the prepared pan. Tap the pan gently on the counter to bring any air bubbles to the surface. Let it sit, uncovered, in the refrigerator for about 2 hours or until it is set to the touch. Once the cheesecake is set, pour the remaining ¾ cup strawberry topping over it. If the topping has set up in the pot, gently heat it for a minute, just until it is pourable. Place the cheesecake back into the refrigerator and allow to set, uncovered, for another 30 minutes, or until the topping is set. At this point it is ready to serve or you can cover the cheesecake with plastic and it can sit in the refrigerator for 24 hours. Last week I was put on a list that took my breath away. Saveur Magazine listed zoebakes.com as one of the 50 food blogs to be reading. 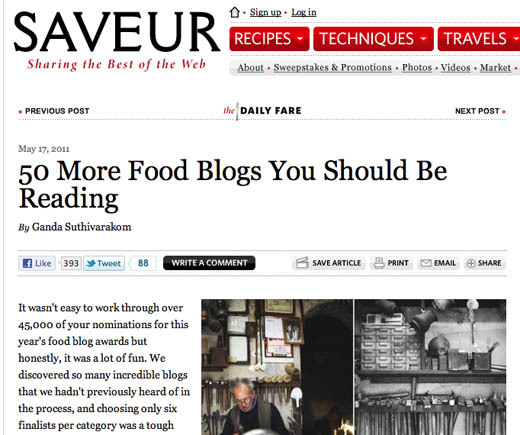 As if being mentioned by Saveur isn’t mind blowing enough, to be named with the other blogs on that list is unbelievable. I am beyond honored to be included with so much talent. Just beautiful Zoe! I rarely use pre-packaged products in my cakes and appreciate your work in developing this recipe…and congratulations on your Saveur recognitions! This is so pretty. Just perfect for a barbeque! Well, I agree with Saveur. People should definitely be reading your blog. Congratulations! Congratulations! And I will be making that cheesecake! Congrats on the Saveur mention-you definitely belong on that list! The cheesecake is absolutely stunning. And making me hungry! Congratulations! You do such a great job with your blog, I am not suprised! This is news only to Saveur, Zoë. We’ve known it since you began writing. They are late to the party. “-0) Mazel tov!! Oh that looks and sounds wonderful. I need to bookmark this as I’ll have a lot of strawberries to put to use after we go picking this weekend. Used to love that cheesecake. Made it tons in the 70s. And congrats on Saveur inclusion. YAY!! Congratulation Zoe, definitely deserve the recognition! Your cheesecake does look very pretty. This is the prettiest thing I have seen in a long time! Just in time with the berries everywhere! Congrats on your inclusion to the great list of blogs. The strawberry cake looks wonderful and perfect for the hot days ahead. Jeez — what took Saveur so long?!!! They have (previously) given recognition to sites that aren’t even in your league. Yours is one of the first sites I go to when I’m looking for inspiration. Congrats! Congratulations on the Saveur mention. The quality of your work is really amazing, you deserve it. Beautiful cake, and with no baking required, impossible not to try on a hot summer day. Thanks! Congrats on your Saveur accommodation. It is well deserved. You always come up with fun treats to make and break them down so they are easy to follow. I adore Saveur and see that you belong in their company. Your chic and personal twists are always interesting. congratulations – you so deserve it!!!! Congratulations…a well deserved spot amongst the best Zoe. What a great no bake cheesecake…YUM! The cheesecake looks fabulous–can’t wait to try it! And making that list? More than deserved! I thought to let you know, that I have placed you (or rather your blog) in the top 10 dessert blogs on my blog. You may be interested to see it and if you wish, I could still add a photo of one your creations. Thank you for the sweet mention of zoebakes! Honored to be on this list! What a lovely cheesecake! Yummy! Thanks for sharing the recipe and for your announcement too. Just wanted to say that your cheesecake is amazing! I did it for mothersday yesterday (here in Sweden) and is was wonderful. Maybe I’ll do it again for the graduation. A more beautiful cake is hard to find. Thank you so much for trying the recipe! So glad you enjoyed it! I gave this recipe to my mom and she made it for a cookout yesterday. She had two observations — the vanilla bean is listed in the ingredients, but the recipe does not tell what to do with it. And she wondered if the strawberry mixture should have been cooled for a while before incorporating it into the cream cheese/whipping cream. Wouldn’t too warm a filling cause the whipped cream to break back down and liquify? But it was really very light, creamy and tasty. We’ll definitely make it again. So pleased that your mom tried the recipe. Thank her for the feedback. I will fix the missing vanilla bean problem. As for the strawberry mixture, I tried it both ways and as long as it wasn’t boiling hot, it seemed to work both ways. It will break down less if it has a chance to cool slightly, but it still works both ways. Hi Zoe, in the recipe you mentioned I can make it with either 8 or 9″ springform pan. Do I need to adjust the ingredients or will it only affect how thick (or tall) the cheesecake will be? Thanks. I have successfully made the cake in both an 8 or 9-inch cake pan, the only difference is the height of the cake. My wonderful friend,Barbara Bubser, made your spectacular strawberry cheesecake and brought it to the office. Now our office has dozens of attorneys, legal assistnats, paralegals, file clerks, etc , etc,. EVERYONE tasted it as it was prominenetly displayed on a ledge in a busy area. And EVERYONE raved about it. Barbara did your fabulous recipe justice. Congrats on your Savieur selection. Well deserved!!! I couldn’t help but making this cheesecake over the weekend. The pics look too tempting! That was my first time working with cream cheese, whipped cream, making strawberry topping, or making crumbs (well, basically everything). We loved how it tasted! A few questions: I made it in a 8″ springform pan, however the cheesecake didn’t fill up to the top of the pan like the one in the pic. Does how long I beat the cream cheese & sugar matter? Also, I didn’t get 1.25 cups of strawberry topping left after I took 3/4 cup for the glaze. How about the whipped cream? I believe I had it at medium peak, but what difference does it make to the cheesecake, if I may now? Most spring form pans are actually 9″ and the cake comes out just a little bit flatter. The one I used is an old pan and 8″. How much strawberry puree were you left with? Was it much less than what I had? I suppose 1 pound of strawberries, depending on their density, can yield slightly different amounts. Did you have enough to finish the top of the cake? The whipped cream should be medium-firm peak. If the cream is too loose it will not hold up to being folded into the cream cheese. It happened exactly the same to me! It tasted good but it was a couple of centimeters tall. It did not look like the picture and that was kind of disappointing. I am sorry to hear this, with a little more information I may be able to figure out what went wrong. I tuned in to KFWB Talk show’s Food & Wine with Chef Jamie Gwen this morning for the first time and was lucky enough to hear you talk about this cheesecake recipe and the merits of using gelatin. Not only will I be trying this recipe soon but I’m also excited to put your Artisan Bread in 5 Minutes a Day to the test. You made a long car ride an interesting and inspiring adventure. Thank you! The top of the cake was fine, as I used 3/4 cup of the sauce. I didn’t measure what’s leftover, but probably only 1/2 of the sauce left in the pan afterward. The texture of the cheesecake look similar to your pic. I’m just wondering about the height. I’ll put a pic of my cheesecake in another comment (so you can just delete/moderate the comment separate from this one) to let you see what I’m talking about. By the way, I stumbled into another blog & she was raving about your artisan bread in 5 minutes a day book! I don’t remember the site though. This is a pic of my cheesecake (you can just delete it). How wonderful – and well deserved! Congrats! This strawberry cheesecake looks wonderful, too. I can almost taste the strawberry-ness right through my screen. Zoe, thank you for this wonderful recipe. I made it for my grand daughter’s seventh birthday. She decorated it with bleeding hearts from my garden. It was absolutely delicious and beautiful! Any chance I could convert it to chocolate amaretto? I made this for my nephew’s party and it was a huge success! I topped it with chocolate covered strawberries. It was beautiful; the cake tasted like strawberries (and not jello!) and it was easy to make. Thanks! Love the recipe. Just made it. But what should I have done with the 1/2 vanilla bean? Thanks. That’s awesome!! You deserve it! I have become obsessed with your recipes, they are delish!! I need to make strawberry cheesecake cupcakes for a birthday this weekend. Is there any way to make these into cupcakes? – I used a 9″ pan and it came out super flat! Compared to the picture shown above the result is frankly disappointing. I made the cake for a birthday and it wasn’t very appealing. – the flavors were very good and the crust came out great. It did not stick to the pan and had a good texture. Other crusts I’ve tried have been just too hard to cut or separate from the rest of the cake. – it would be very helpful to have the ingredients listed in grams or ounces. I live outside the US and to properly substitute some ingredients that would have been quite an aid. I am sorry to hear that it didn’t turn out for you. I have a feeling that the blame is with the gelatin. There are different strengths of gelatin available, so if you weren’t using the brand that we tend to get in the US, it may have been a much weaker variety. So, your assessment of needing double the gelatin may be spot on. I think your idea of using grams and ounces is a good one and will do that when I can. Desserts with gelatin can not be frozen or it breaks down the gelatin and it will become weepy and lose its shape. Congratulations! You are highly deserving of this honor, I love everything you do. I’ve take both of your Craftsy classes (bread and cheesecake) and this blog is terrific. Your baked goods are beautiful but perfectly doable for the average baker. Brilliant! Can’t wait to try this.